Funkychef.com is very proud to present our first Vineyard to be featured on the site as the result of a recent ''Tasting'' experience in the Napa Valley. 98 Reserve Cabernet Sauvignon WINEMAKER'S NOTES - The grapes for this wine came from vineyards throughout the upper Napa Valley, from Rutherford to Spring Mountain. The blend is round, fat and concentrated, with complex flavors of dark fruits and herbs, and with a long spice and vanilla finish from its time in French oak barrels. 'Antigua' Dessert Wine -- Merryvale's gold-medal winning Muscat de Frontignan dessert wine is fortified with fine California brandy and aged an average 11 years in French oak for an utterly smooth, subtle aroma, flavor and texture. It really is a top quality drop! Winemaking Philosophy: Our goal is to craft elegant, complex world-class wines in the finest European style yet reflecting the exuberant fruit from Napa Valley's finest vineyards. To that end, we emphasize quality over quantity and no compromises. Reserve & Single-Vineyard wines: Sauvignon Blanc, Chardonnays, Pinot Noir, Merlots, Cabernet Sauvignons, 'Antigua' Muscat de Frontignan and other limited bottlings. Tasting Room: Located in Marryvale historic winery - the ultimate Napa Valley tasting environment. Open daily 10 a.m. to 6:30 p.m. 707 963 7777. 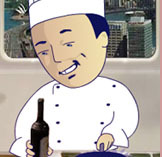 Funkychef.com would like to thank everybody at Merryvale for a excellent & friendly experience, keep up the good work! Information provided by Merryvale vineyard, check out the new Merryvale website. Where next for the Funkychef....? Fining red wines with fresh egg whites is a traditional method of modifying the wine's tannin structure. Egg whites are principally made of the protein albumin. Proteins have a molecular structure that allows them to bind tightly with phenolic compounds, the large group that includes anthocyanins, which give wine its color and tannins, in turn giving wine significant parts of its mouth-feel. Albumin is particularly good at removing astringent tannins without affecting other desirable phenolic components. At Merryvale, we make red wines using long skin contact times and extensive barrel aging in new French oak with the intent of producing rich flavor, dark color and concentrated mouth-feel. These methods will often produce wines with a little excess astringency as well. Fining with a small, but appropriate amount of fresh egg white will almost always make the wine's structure a little better, removing the proper amount of aggressive astringency by taking out some of the "gritty" tannins. The clarity of the wine is sometimes improved as well but that is a secondary benefit. Some wine writers, and even winemakers, have placed "unfined" wines on an exalted pedestal, disparaging human intervention in the glorious product of nature that is wine. That view ignores the fact that human intervention is sometimes good, and fining can make a wine better. Imagine a fine piece of furniture, lovingly cut and assembled from the finest hardwood by a skilled craftsman. The craftsman will carefully sand the wood to remove inappropriate roughness before finishing it. No one would say that unsanded furniture was better for the lack of human intervention. The same is true for a wine carefully made from outstanding grapes, but left a little gritty by not using a suitable technique like egg white fining to improve the final result. A skilled craftsman, in whatever medium, uses all appropriate tools and methods to produce the finest product possible. Where next for Funkychef maybe..... Champagne, France? Or back downunder?